I find sale-priced cashmere very hard to resist. 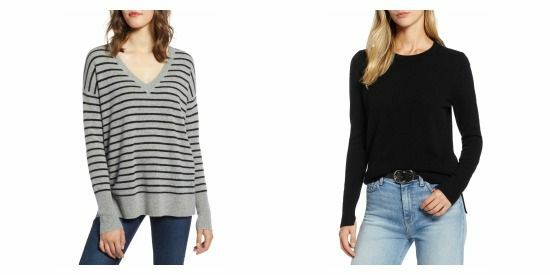 Just in time for holiday gifting -- for others or yourself -- Nordstrom has put two classic cashmere sweater silhouettes from their Halogen house label on sale. This is about as good as it gets in cashmere sweater land. The Relaxed V-Neck Cashmere Sweater has a kick-back look that is weekend-ready and perfect for layering. It comes in twelve colors, including two neutral striped options that look straight out of a how-to-dress-French guidebook. For a more refined look, the Crewneck Cashmere Sweater is an appealing option. It has a side slit that makes it a bit more interesting than a plain crewneck, but it’s still 100% work appropriate. It comes in fourteen color options, including two colorful striped patterns and a very pretty navy blue Donegal-look knit. Both sweaters are available in sizes XS to XXL regular and XXS to XL petite, although some of the more popular size and color combinations currently have very limited inventory. Shockingly, very few combinations are sold out. Shipping and returns are both free. → Buy the Halogen Relaxed V-Neck Cashmere Sweater, $58.90 (was $89.00), at nordstrom.com. → Buy the Halogen Crewneck Cashmere Sweater, $58.90 (was $89.00), at nordstrom.com.